Who are we? And why are we here? 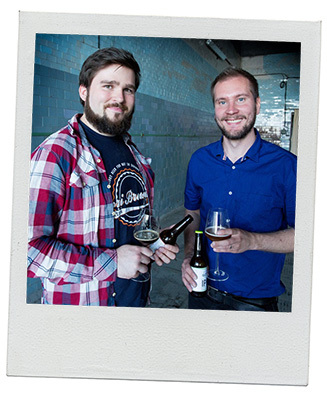 Crowdfunded brewery started by young Finns determined to make their impact on the world of craft beer in Northern Europe. They moved away from their home country to start a brewery without compromises. Bringing Nordic ideas to “Belgo-American” brewing in a search of experiences in taste. Summarized into one sentence, serious beer for not so serious people. Pyry Hurula used to work in a big energy company portfolio management, making sure metropolitan Helsinki area was all lit and heated. He has always been a part-time marketing entrepreneur as well. In Sori, he’s the creative and strategic head. He’s also the one behind all the graphics. Pyry’s phone is integrated to his hand and he’s devoted to connecting with our fans through social media. Heikki Uotila used to market women’s’ shoes and flirt with bloggers for one of the Europe’s biggest online retailer. 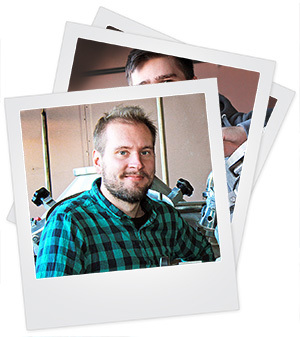 Heikki was the one igniting the idea of having a brewery, but it took two to make it to reality. 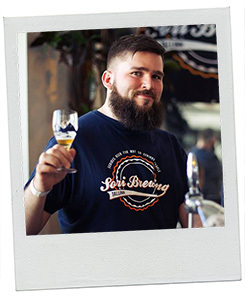 He was probably good in marketing ladies shoes and all, now he is the man behind the beers and production planning. At some point, there were three of us. After a year of learning entrepreneurship the hard way, one decided to move and for work in a lab with an another brewery. A great lesson about entrepreneurship; it requires a lot from you and people around you. We have remained as friends and we all gained some! Now, Sori Brewing has grown to a real brewery with talented brewers and people behind the scenes working every day to push limits and create new. Steadily we grow our family and make this crazy story even bigger. By the end of 2016 there are about ten of us. We wanted to be those guys who brew world class craft beer, so we wanted to brew without compromises.We met in an academic beer society (BOSA), which brought together beer enthusiasts and home brewers as well. After the countless beer tasting aftermaths (and beers) conversations always led back to same topics. Why is no one in Finland making awesome beers that people crave all over the world? At some point, brainstorming escalated and we were determined to start our own brewery. We wanted to be those guys who brew world class craft beer, so we wanted to brew without compromises. Staying in Finland as brewers would have been like being painters painting only with black and white.Everything in the equation of starting a brewery seemed fine but one thing. We still lived in a Nordic country with twisted and old post-prohibition alcohol laws. In Finland, everyone has their focus in <4.7 % ABV beers since all above that is sold either in a restaurant or a monopoly store. Staying in Finland as brewers would have been like being painters painting only with black and white. It would be very hard to create a fast growing exporting brewery if we stayed. We did one-year pure planning and homework with our idea. We pushed the idea out of our comfort zone and there the fun began. We started a Finnish craft brewery in Estonia. We’ve done almost everything in very unconventional ways so far. We are young. We are the one of the first ones in the world to start a brewery with a massive crowdfunding campaign. We raised 0,5 m€ through a crowdfunding we executed ourselves without any platform. And we started growing fast and then we did an additional 0,5 m€ to meet the demand. All media and even many politicians commented on what we were doing. We like to think that we even made an impact on the Finnish alcohol policy. Being a bit unorthodox, we set the brewery on the third floor of an old Soviet-era factory complex. We sure will tell you the story when you come by – there is a one of a kind story involving cruise missiles and trains gone missing. When you step into the building, it’s instant goosebumps. Worst nightmare would be to be boring. That’s why we keep pushing the boundaries. Sori is where this all began, a small block in Tampere, Finland. We learned basics from brewing as home brewers in an academic beer society, which is now the most popular one in Finland. Sori also represents what we are: it’s an apology since we Finns always apologize to show our humble nature. And we are also there to rock a couple corporate brewers’ boats. So, we are Sori. Sori Brewing is located in an old Soviet-era factory in the middle of former restricted Dvigatel factory complex. That history is still very strongly present here, even though everything has moved on.